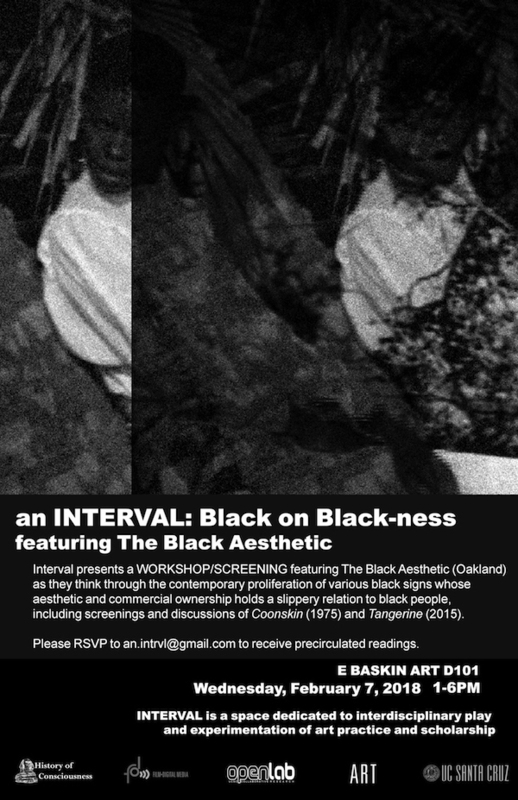 INTERVAL is partnering with The Black Aesthetic (TBA) on an event titled “Black on Black-ness” that seeks to think through the contemporary proliferation of various black signs whose aesthetic and commercial ownership holds a slippery relation to black people. TBA will screen and lead a workshop on Coonskin (1975) and Tangerine (2015)—films that provide ways of speaking about controversy, black aesthetics and questions of authorship. This event is organized by INTERVAL and hosted by OpenLab with support from Film & Digital Media, History of Consciousness, and the Art Department at UCSC. INTERVAL is a space dedicated to interdisciplinary play and experimentation in art and scholarship. Space is limited. Please RSVP to an.intrvl@gmail.com to receive precirculated readings.